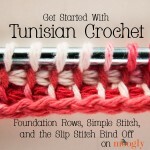 The Tunisian Knit Stitch can be worked over any number of stitches, and starts with the two Foundation Rows that start off almost every Tunisian Stitch pattern. I’ve repeated them here as a reminder. 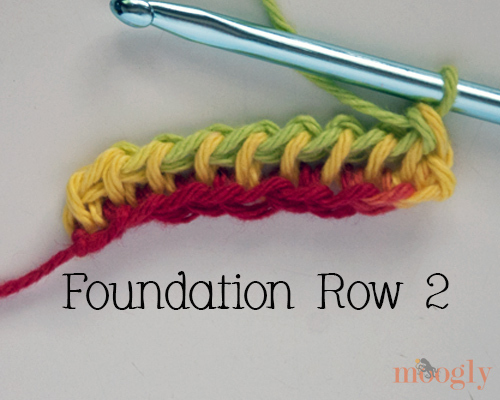 Row 1 (Foundation Row – Forward Pass): Chain to desired length – any number you like. Then working into the second loop from the hook, insert the hook and pull up a loop from each chain to the end. At the end you should have as many loops on the hook as you had chains. 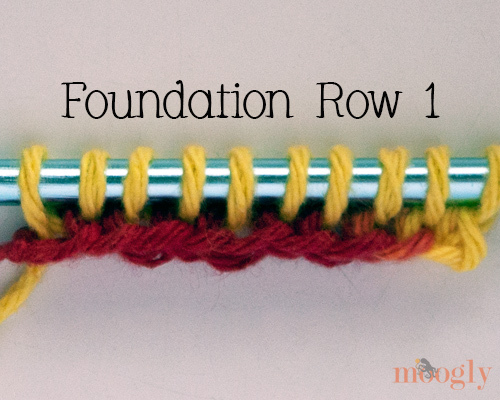 Row 2 (Foundation Row – Return Pass): Yarn over and pull through the first loop – this is like a chain 1. *Yarn over and pull through 2 loops, repeating from * to end. Row 3 (Tunisian Knit Stitch – Forward Pass): The loop already on the hook counts as the first loop or stitch of this row. 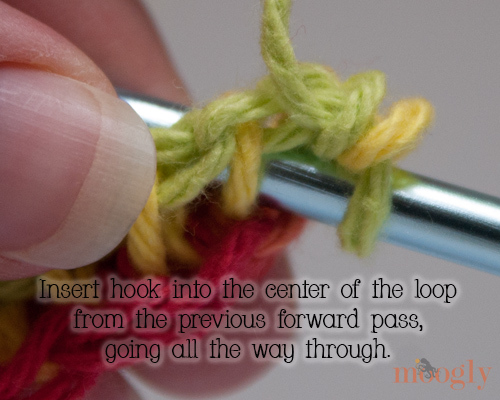 So insert your hook into the second loop from the previous forward pass, behind the front half of the loop and in front of the back half of that loop, and on through to the back of the fabric. Yarn over and pull up a loop. Repeat in each remaining stitch to the end. Row 4: (Tunisian Knit Stitch – Return Pass): (same as Return Pass of Foundation Rows) Yarn over and pull through the first loop – this is like a chain 1. *Yarn over and pull through 2 loops, repeating from * to end. Repeat Rows 3 and 4 until you reach the length desired! 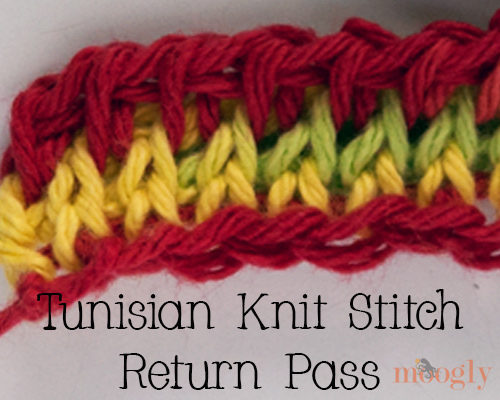 Keep going until you’ve got the tension and stitches looking the way you like, and you’ll have mastered the Tunisian Knit Stitch! And that’s all there is to it! 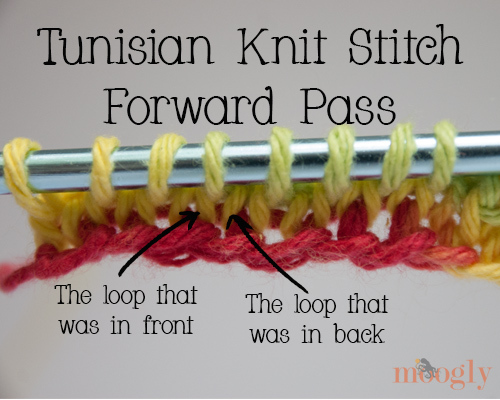 If you’ve been following along with the Tunisian videos so far, you now know Tunisian Foundation Rows, Simple Stitch, Knit Stitch, and the Slip Stitch Bind-Off! And if you’ve made the Tunisian Pebbles Dishcloth, you can add Tunisian Pebble Stitch and Single Crochet Bind-Off to the list too. 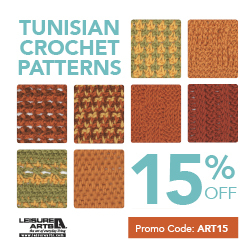 Tunisian isn’t scary – it’s easy if you take it one step at a time, and practice. 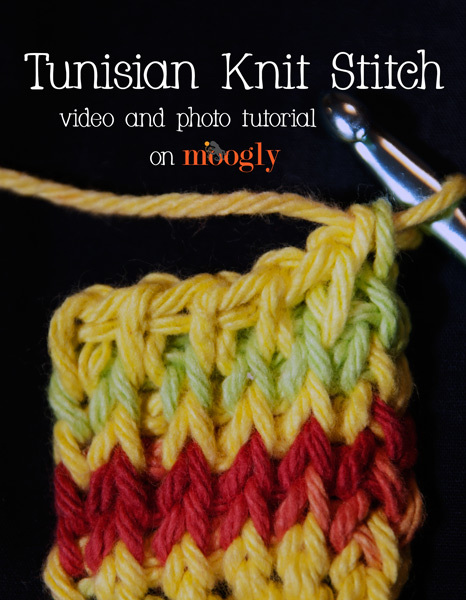 I look forward to showing you more of what you can do with Tunisian crochet in future tutorials! Thanks for the tutorials. I bought a pattern book a few months ago and sort of got the hang of it, but your pictures/videos have been even more helpful. 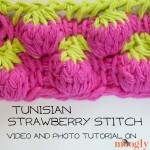 I think this is my favorite of the tunisian stitches you’ve taught us! I love the look of it. Thanks! I can’t wait to try this, you tutorials are the best! Thank you for all you’re help in teaching us all the many stitches. You’re welcome leolaura! I’m glad you enjoy them! Oh no!..seriously..AWESOME words can be used for this epic tutorial…you are sooooooo creative!..i am loving your tutorials!..they all are toooooo much adorable! ♥♥♥! Thank you so much for the Tks tutorial. I looked at other tuts and this is the best! Thank you very much for the awesome tutorials! Recently bought a pattern that uses this stitch, but now have to learn the stitch. So THANK YOU !!! This is a tutorial I have been looking for and will be trying in the near future. thanks for sharing. You are a fantastic teacher. Detailed, slow. clear video. Thanks for showing the video without your finger or thump being on the way!!! Thanks for such an easy to understand tutorial. I was never sure where to insert the hook, but now I think I have the hang of it. I’m so glad to hear it, thank you Kathryn! 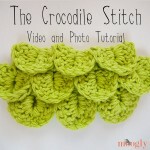 This is my favourite site for all things crochet, and I just love your video tutorials, thank you! I’m trying to make myself a Tunisian ripple scarf using the free pattern from the moralefibre site. She suggests checking out your tutorials for the tks, however I can’t access it. The heading is there but no video 😢. I’ve tried a few of your Tunisian patterns and love the results, but this is my first attempt at tks. I have the basic knit stitch figured oud, and can manage increasing and decreasing in the first tks row. But I’m failing miserably in the subsequent ‘ripple’ rows and end up with either too many or not enough stitches😂. I was hop8ng your tks video tutorial would save my sanity but I can’t get to it. I know the ripple scarf isn’t your pattern but I’m hoping you have a wonderful tutorial somewhere on your site. Thanks so much Tamara. My continuing failures with this ripple stitch have caused me no end of frustration ha ha. I’ll have another go when I get home from work tonight (it’s only lunch time on Tue here in Australia), and fingers crossed.. Your videos are so helpful, thank you. I’ve mastered the basic knit stitch, and although I know (theoretically) how to increase and decrease evenly across rows, for some reason the result is a disaster. The subsequent return pass is fine, but the next forward pass row is a mess. Often the stitch looks back to front, ie the front Post is on the Right instead of the left side of the stitch. Not to mention I either have too many or not enough stitches left over..
Do you have any video tutorials in your usual wonderful style to help please? I sooo want to make myself the ripple scarf with winter almost here. I’m hoping I’m just making a small technical mistake. Hi Tracey! Unfortunately, I don’t have any Tunisian ripple tutorials – have you tried searching Kim Guzman’s videos on YouTube? She is quite the Tunisian expert!